"Nongovernmental organizations working in Nigeria have called for renewed focus on supporting women and girls who escape abduction, as the country marked the second anniversary of the Chibok school kidnappings last week. 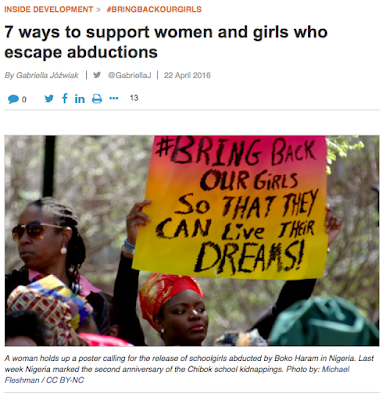 Two hundred and nineteen of the 276 girls abducted on April 14, 2014, from their secondary school in northeastern Nigeria by Muslim militant group Boko Haram are still missing. But aid organizations working in the country say concentrating on their rescue is not enough. Boko Haram has abducted at least 2,000 women and girls in the country since 2012, according to estimates from charities International Alert and Amnesty International. Those who return from abduction also need support. Boko Haram characteristically forces captive girls to marry its members. Many are raped and become pregnant as a result. Devex spoke to Kimairis Toogood, International Alert’s senior peace-building adviser and The Wellbeing Foundation Africa’s Nigeria Country Director De Luther-King Fasehun about the best ways to support the women and girls who survive such ordeals..."
Read the full article at Devex.com. I am really sorry to hear that many of those girls are raped and become pregnant as a result. It's awful!I'm ready to support those women and girls who escape abductions! I think these women are happy to be supported, thanks for this list of what we can do to help them! You are very lucky to have such wonderful service, which is very popular among students. Thank you very much for posting. Next time lucky!